The newly elected president of South Korea, Moon Jae-in, is due to be sworn in after a decisive election victory. The 64-year-old human rights lawyer, known for his liberal views, has vowed to unify a divided country. South Korea is still reeling from a corruption scandal which saw his predecessor impeached. Mr Moon has also promised to shore up a fragile economy, and wants to increase contact with North Korea, in a departure from current policy. He officially began his term early on Wednesday morning after South Korea’s election commission confirmed his win, filling a leadership vacuum in the wake of Park Geun-hye’s impeachment. Local media said he had already spoken with the military chief on domestic security and North Korea developments. Mr Moon will be sworn in as South Korea’s 19th president at a midday (03:00 GMT) ceremony at the National Assembly building. Mr Moon, the Democratic Party candidate, took 41.1% of the vote on Tuesday, while conservative candidate Hong Joon-pyo took 25.5%. Centrist Ahn Cheol-soo, who had been widely seen as a strong contender, came third with 21.4%. 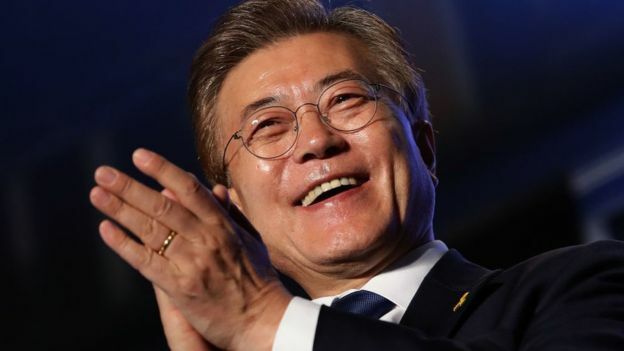 Speaking to supporters on Tuesday night, Mr Moon said he would serve all South Koreans and build “a just, united country”. He has also been critical of the two previous conservative administrations for failing to stop North Korea’s weapons development. But while tensions on the Korean peninsula ensured the election was closely watched internationally, for South Koreans the priority has been corruption and the economy, with youth unemployment stubbornly high. Mr Moon has vowed to address these problems through reforms, including ensuring a level playing field for smaller businesses.